I have been pretty stressed lately from a lot of things including Hubby's health and all. And as a result of that. My hair have been falling out more drastically then normal. So much that I am worried. So out of curiosity I contacted Yun Nam via a newspaper advertisement and they invited me to come for an assessment and free treatment. I went to the Yun Nam centre at the Mid Valley boulevard. They took my details and I was asked to wait until my consultant came to my assistance. Then I was brought to the first floor for treatment. 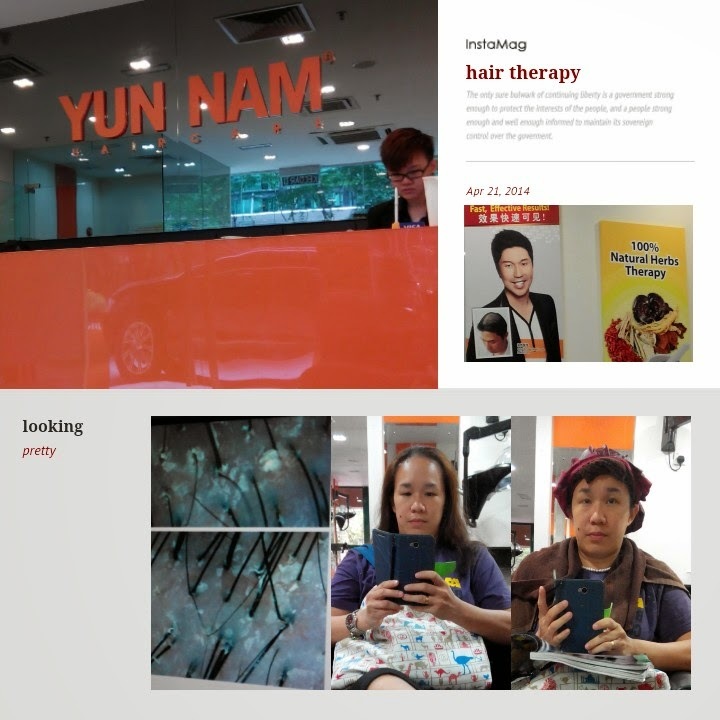 The treatment was supposedly worth RM580!!! She washed my hair with some herbal shampoo and sprayed a few tonic and such while shampooing then only was my hair rinsed and treatment applied. Since the base of the shampoo and treatment were all of herbal base, there was a very strong smell of medicinal herbs. The treatment was left with a mask on top for almost an hour. There was a cool and tingling feeling while waiting. Then the consultant rinsed the treatment off and applied some Jasmine conditioner. Then blew dry my hair. Once done I was taken to the consultation room again to rescan my scalp condition which was considerably much better then before..
Then came the sales pitch. I was recommended to undergo the full package of at least 10 treatments in about 3 months. All of that would cost my something like RM 4000++. When I mention it was out of my budget, then I was offered another package that costed RM 2000++. And when I declined, I was offered a very basic package of RM988. I did not sign up for any of the packages as I felt it was too over inflatedly priced and I did not have that much money to spare.. So I was asked to sign the form and given a small pouch and samples of the shampoo, conditioner and tonic (I think).